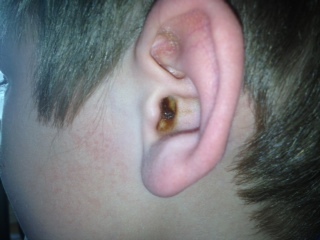 Excessive ear wax in David? I just saw this in David’s ear. It hasn’t been that many days since I cleaned his ears out. This amount of wax just doesn’t seem normal to me, but I don’t know. 1 Response to Excessive ear wax in David? He actually has so much more wax in his ear right now, this doesn’t seem like a lot of wax at all, lol. I wonder what causes it…he just had another sinus infection a few weeks ago.